Alaska is the ninth biggest seafood-producing region in the world, with 80 percent of high-value wild salmon species like sockeye, coho and king salmon originating from its waters. 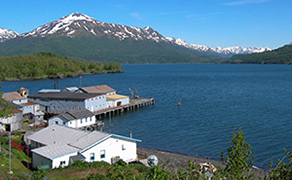 The state of Alaska's commercial fishery management harvest more than 29 million fish each year. Serious anglers will have their pick from pink, chum, sockeye, silver and king salmon, if they know which months to arrive. The Best Fishing: Generally speaking, if you come to Alaska from May through October, you will catch some sort of delicious salmon. These months also conveniently coincide with the nicest weather the state has to offer. Experienced fishermen like to time their Alaska fishing trips based on their favorite types of salmon. For instance, arrive from late May to early July to catch king salmon, which are also called chinook salmon. Sockeye salmon runs are also prevalent from June to late July. From mid-July to mid-August, look for red salmon or pink chum salmon. Catch silver salmon, otherwise called coho salmon, later in the season from July to October. Remote Fishing: Kodiak Island's legendary roadside salmon fishing offers crowd-free Alaskan salmon casting where your biggest contender might be a bear. Lure king salmon from June 1 to July 10, where you can expect to reel in 20 to 25 pound fish. Timing is especially crucial, though, as 50 percent of the fish have moved upriver by June 15 and 90 percent of the fish are gone by July 1st. Hook 4 to 7 pound sockeye salmon from June 10 to August 1, with a peak from July 1 to August 1. Take your pick from 50,000 three to five pound pink salmon from July 20 to August 20. Silver salmon runs of 150,000 strong stop to bite from mid-August to their peak in late September. The Kenai River: Alaska's Kenai River offers silvers, pinks, reds and kings from May through October, where salmon weighing up to 98 pounds have been captured. Early runs through June average around 16,000 fish, whereas late runs beginning July 1 peak at 41,000 fish in the middle of the month. The Kenai River also boasts over one million sockeye salmon averaging between 8 and 12 pounds, which arrive in late May and continue steadily well into August. Millions of pink "humpback" salmon fill the river for three weeks in late July through mid-August. Ocean Fishing: Southeast Alaska's Pacific Ocean king salmon fishing is in full swing in May and June, with stragglers swimming by through mid-August. July, August and early September host the late silver salmon run. Ketchikan, Sitka and Kodiak Island - home to Alaska's largest marine silver salmon fishery, ranging from 30 to 126 pounds. Tower Rock Lodge is located in the heart of salmon and trout fishing country where each year over a million salmon pass by our five riverfront acres on the lower Kenai River. We specialize in fishing for trophy size King Salmon (Chinook), Red Salmon (Sockeye), Silver Salmon (Coho), Rainbow Trout, Dolly Varden and huge Pacific Halibut. From May through September the Kenai River and Kenai Peninsula (with the nearby saltwater) provide visitors with over a dozen different places to fish. There is also sightseeing, wildlife and bear viewing, hiking, canoeing, clamming, sea life and glacier tours, shopping and even golfing all connected by an excellent road system. Enjoy spectacular clear-water stream fishing opportunities abound nearby Zachar Bay Lodge. Depending upon the season, all five pacific salmon species return seasonally to streams within 20 minutes of the Lodge. Dolly Varden Trout and Rainbow also follow the salmon migrations, and are often caught while targeting salmon. Our two favorite streams (Zachar & Frazer River)are providing fantastic sport fishing opportunities, and are often untouched by other sport fisherman due to their remoteness. 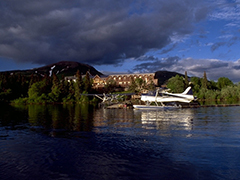 Zachar Bay Lodge was originally established as a wilderness lodge in 1989, and the 'Cannery' was originally constucted in the early 1920's as a fish processing plant. 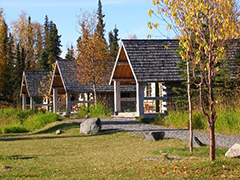 Mission Lodge is located on the shores of Lake Aleknagik in the heart of the world famous Bristol Bay region of Southwest Alaska. This area offers unsurpassed trophy fishing for Salmon and Trout in a spectacular wilderness setting. 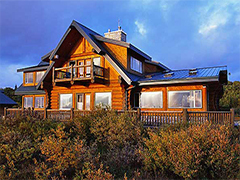 Easy access, deluxe facilities and unsurpassed trophy fishing make Mission Lodge, the classic Alaska fly out lodge experience. Sauna, Hot tub, sumptuous dining, a comfortable lounge and recreation area are added features of Mission Lodge. A large deck surrounding the facility is just steps from the dock, float planes and boats. Large bay windows frame views of Lake Aleknagik and the beautiful mountains beyond. This is a rugged immense land of startling beauty.